Motor vehicle crashes are a leading cause of death—about 33,000 people die in crashes each year. The Department of Transportation makes highway safety rules based upon how much safety measures will cost. We are hoping to change that and move toward a Vision Zero safety strategy model with goals of: Zero Deaths, Zero Serious Injuries, Zero Fear of Traffic. After losing two daughters in a truck underride crash on May 4, 2013, our family made a positive impact one year later by taking over 11,000 signatures on our AnnaLeah & Mary Stand Up For Truck Safety Care2 Petition to DOT in Washington, DC. And we have set up a non-profit to promote highway safety research and federal regulations to protect motorists, pedestrians, & cyclists. One of the biggest challenges to reducing motor vehicle deaths is the cost/benefit analysis. The problem comes in when human life and health get the short end of the stick. The result is that many safety measures are blocked because they would cost more to implement than the “worth” of the “small” number of human lives which would be saved. That's just not right. 3. Apply Vision Zero principles by requiring crash test-based performance standards for truck side and rear underride guards. 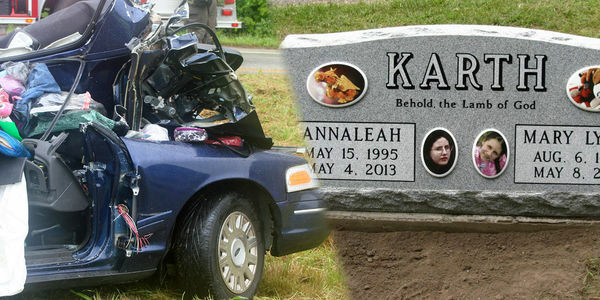 Please sign this petition in memory of AnnaLeah & Mary and make the roads safer for us all. After losing two daughters, AnnaLeah (17) and Mary (13) in a truck underride crash on May 4, 2013, the Karth family took over 11,000 envelopes with signed petitions from the AnnaLeah & Mary Stand Up For Truck Safety Care2 Petition to Washington, DC, one year later on May 5, 2014. At that time, they met with administrators from FMCSA and NHTSA and discussed, at length, their concerns about truck safety issues. Since that time, they have set up a non-profit, AnnaLeah & Mary for Truck Safety, to promote highway safety research and federal regulations to protect motorists, pedestrians, & cyclists. And, in fact, there has been some progress with the upcoming implementation of Electronic Logging Devices and the initiation of rulemaking steps related to underride guards and minimum liability insurance for truck companies. However, we are concerned that these safety measures, as well as others, are being unnecessarily delayed and/or weakened. As you know, the Department of Transportation makes highway safety rules based upon how much safety measures will cost. We are hoping to change that and promote a Vision Zero safety strategy model with goals of Zero Deaths, Zero Injuries, Zero Fear of Traffic. One of the biggest challenges to making change is the cost/benefit analysis. On the one side there are lives to be saved and on the other side there are companies working to make money. The trick is to try and meet everyone’s needs. The solution has to be effective in saving lives while still being affordable for companies so that they can make the changes necessary without a lot of struggle. The problem comes in when human life and health get the short end of the stick. The result is that many safety measures are blocked because they would cost more to implement than the “worth” of the “small” number of human lives which would be saved. That's just not right. 1. Change DOT rulemaking policy to move away from a cost/benefit model and adopt a more humanistic, rational Vision Zero safety strategy model. 2. Apply Vision Zero principles by requiring crash test-based performance standards for truck underride guards rather than force-based design standards along with success at higher speeds—to include rear (both centered and offset) and side guards for both Single Unit Trucks and trailers. 3. Apply Vision Zero principles by initiating rulemaking to require forward collision avoidance and mitigation braking (F-CAM) systems on all new large trucks and buses with a gross vehicle weight rating of 10,000 lbs. or more. On average, 33,000 people die each year in crashes on our roads. Our families cannot continue to sustain this unacceptably high number of losses and injuries. We urge you to take immediate action so that more lives will not be lost and to assure us that safety is your number one priority. * On December 7, 2015, NHTSA announced the next step in rulemaking to improve Underride Guards. * On December 10, 2015, FMCSA released the Final Rule for the Electronic Logging Devices to log trucker hours of service. Please continue to support our efforts to make the roads safer by our Vision Zero Petition & Underride Research. Please share the petition & video. Help reduce tragic, unnecessary crashes. Why are we devoting our lives to asking for change? The answer is simple: because our daughters may have lost their lives due to the lack of a Vision Zero policy. If the best possible protection had been pursued when the underride guard regulations were last updated (1996), trucks on the road today would be much safer to be driving around. Mary & AnnaLeah might even still be around.